Muhammad caught 50 passes for 867 yards (17.3 avg.) and three touchdowns in 1995, his last college season, and was chosen by the Panthers in the second round of the ’96 NFL draft. While hampered by a hamstring injury as a rookie, he showed promise, catching 25 passes for 407 yards (16.3 avg.) and impressing with his size as well as speed. Following another injury-plagued season in 1997, Muhammad started every game in ’98 and broke out with 68 receptions for 941 yards (13.8 avg.) and six TDs. Panthers went 8-8 to finish second in the NFC West while ranking second in the NFL in passing yards (4161) and third in touchdowns (50). Muhammad led the NFL with 102 catches in 2000, gaining 1183 yards (11.6 avg.) and scoring six touchdowns. Injuries and off-field problems caused his production to drop off significantly in 2001, but there was improvement in 2002 and ’03, and he had an 85-yard scoring reception in the Super Bowl loss to New England following the latter season. Muhammad had a big year in 2004, leading the NFL with 1405 yards and 16 TDs on his 93 pass receptions and receiving consensus first-team All-NFL honors as well as selection to the Pro Bowl. However, he was released by the Panthers in the offseason due to contract issues and moved on to the Chicago Bears in 2005, where with his diminished speed combining with inconsistency at quarterback, his numbers dropped off. He spent three years with the Bears before returning to Carolina for his last two seasons in 2008 and ’09. Overall, Muhammad caught 860 passes for 11,438 yards (13.3 avg.) and 62 touchdowns. Of those totals, 696 receptions for 9255 yards and 50 TDs came with the Panthers. 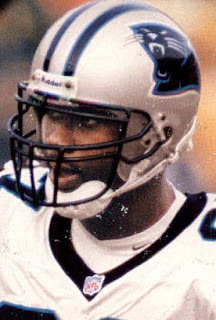 Muhammad was a first-team All-NFL selection once and was named to two Pro Bowls.